ECHO - The Echo Cougars (1A Big Sky East) hosted the Ione Cardinals (1A Big Sky East) in the first league game of the season on Tuesday. 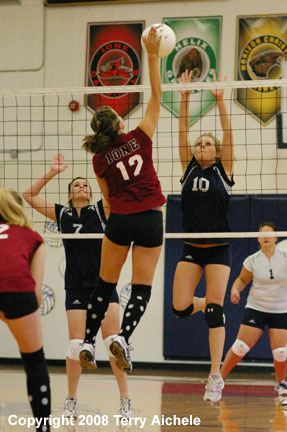 Echo won the match 3-1 with set scores of 25-15, 12-25, 25-22, and 25-19. The Cougars started off the third game taking an early 3-1 lead. Then Ione, under the service of of Tyree Svetich, went on a six point run to go from 2-4 to a 9-4 lead. The Cougars battled back during Sara Reese's serve to tie the set at 11-11 then continue on to a 15-11 lead. The Cougars played strong through the rest of the set with three kills by Kirsten McCallum leading the team to a 25-22 win. Game four had the two teams exchanging the lead until Shilah HIlliard and Elizabeth Ferge took the serve to a 9-6 lead for the Cougars. From that point on the Cougars pulled away to a seven point lead while Taylor Tarvin was serving at 20-13. Shilah Hilliard served the Cougars to a 24-14 lead. Ione took control on a sideout at 24-15 and Sarah Stillman was serving until the Cardinals were at 19-25 and the serve went out of bounds giving Echo the win. Echo's head coach Candice Valentine was very pleased to get the league win. "The win felt really good. It's been a long time coming. The league is pretty even this year. We definitely have a chance to be at the top. To start off league with a win is huge. "We go to Condon on Friday and it will be a real test for us. We're excited to get the season going. "Kirsten McCallum was huge for us tonight. 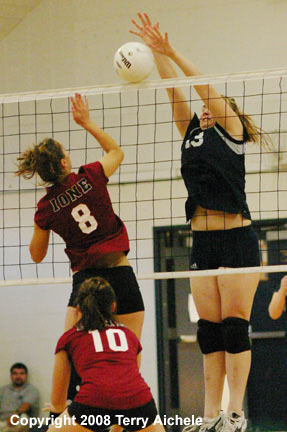 She had a couple key blocks and hits that kept us going. She played really big for us. 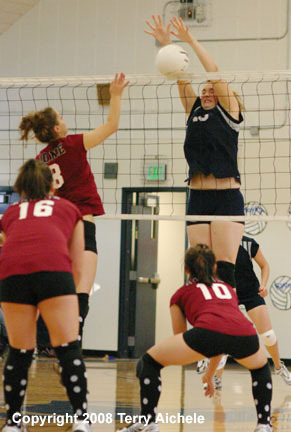 Mariah McQuown, my senior setter, is a staple for this team. She holds everybody together." 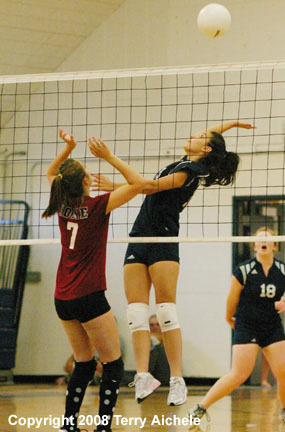 LEFT - Echo senior Sydney Swaggart goes up to block a shot by Tiana Camarillo of Ione. 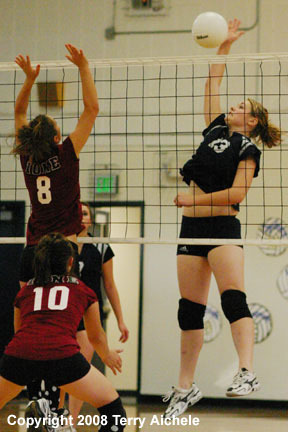 RIGHT - Echo's Kirsten McCallum connects on an offensive block in the third set on Tuesday. LEFT - Kirsten McCallum fires off a big hit. 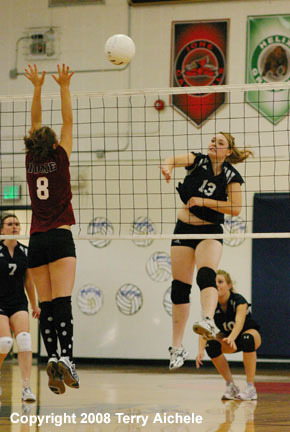 RIGHT - Kirsten once again hits a strong shot to continue to dominate the match at the net. LEFT - Elizabeth Ferge of Echo lets fly with a strong attacking shot. RIGHT - Sydney Swaggart lets loose a shot at the net. 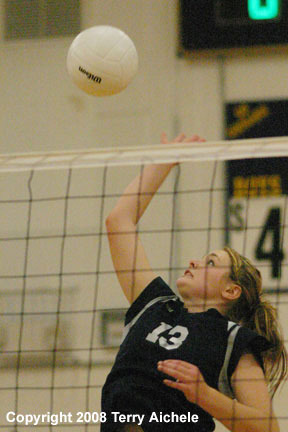 LEFT - Kirsten McCallum continued her dominance at the net in the fourth set. 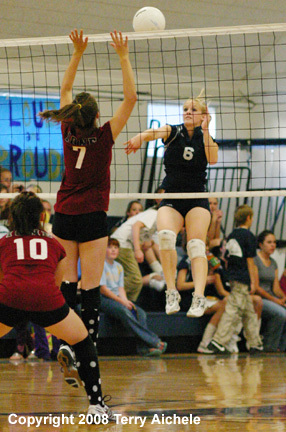 RIGHT - Kirsetn McCallum with another offensive block at the net.